For The Good Archives | Page 2 of 2 | M.E. If you are trying to figure out Obamacare (aka Affordable Care Act) and finding a new insurance plan, this could be a good place to start. Doyle Rowe, LTD. has been a client of mine for years and they are experts on all the changes and plans. I’m a huge Tim Ferris fan. I’ve read most of his books and the articles on his blog seem to resonate more than anything else I can find. The latest article was written by Marc Ecko (Ecko Brands Unlimited) and is pure genius. If you create anything unique; products, art, music, toys, etc… read this article on the swag bomb. Today is the 4th annual Rock The Heart benefit, which is organized by the Fox Valley Heart Foundation. It’s an awesome event that has been held each year at Ballydoyle’s Aurora. The Fund focuses on increasing awareness and education through community outreach programs and public workshops related to cardiovascular risk reduction topics. It has been my privilege to perform each year with whatever band I’m in at the time. This year, Lincoln Don’t Lie will be performing from 7-8:30pm and we plan on being extra rowdy tonight!! 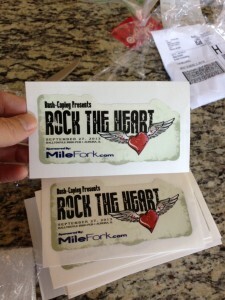 One of my startup companies, MileFork has donated a boatload of decals (thanks Mark! ).